Your family's dental health, care & comfort are of the utmost importance to us. Our experienced and professional staff enjoys working together. Several of our dentists have been here for more than 20 years, so it’s as if we’re working with family. Our staff speaks English and Spanish, and we treat 6-month old babies to those in their golden years. Your family’s dental health, care, and comfort are of the utmost importance to us. By improving dental education for you and your family, we believe we can improve overall oral health and dentistry across Central Texas. Our motto is prevention through education when it comes to preserving the health of your teeth. From simple fillings to full cosmetic reconstructions, the Waco family dentist team at Stonewood Dental employs all their training to secure your dental health and support the smile that gives you confidence. A child who is six months old is ready for his/her first dental visit and should see the dentist every six months from then on. 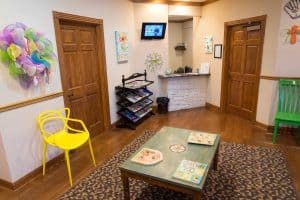 Our goal is to teach parents and children about healthy self-care of the teeth and gums, encourage patients of all ages to floss, and restore the wear and damage that come with time. We consider education to be an active part of dental treatment. Enabling patients with knowledge is arming them with the power to prevent cavities. There are easy, daily steps to take to prevent plaque and tooth decay. And our team of Waco family dentists believes preventative education should be available to everyone, no matter what language you speak. Dr. Tomas Alicea is an integral member of our family of dentists here at Stonewood. He has over 35 years of experience, and he has the unique distinction of being the only Spanish speaking dentist in private practice serving the dental needs of Central Texans. Spanish-speaking patients from Waco, Robinson, Hewitt, McGregor, Bellmead and beyond come to Stonewood for an appointment with Dr. Alicea. When should your kid start seeing the dentist?